The Baby Camel Down is a warm golden brown and so very soft. This short stapled fiber is prepared in a manner that makes it very easy to spin and will do well, whether spun with a lot of loft or tightly for sturdy garments. It pairs wonderfully with merino and silk in our spectacular blends and will take dye beautifully. Cleaned, dehaired and combed baby camel down is a natural light camel brown with an approximate staple length of 5 inches (55mm) and an approximate micron count of 18. Camel down is the soft warm inner down of a bactrian camel with a fiber structure similar to cashmere. The down is usually 1-3 inches long with a micron count of about 15-22 microns. Camel down does not felt easily. Baby Camel Top has been becoming more popular every year. We offer Baby Camel Top which is only 18 microns (only 2 microns more than most cashmere) and which can capture the attention of hand spinners who seek a luxury fiber at a low price. It has a staple length of 5 inches which is quite long for camel. 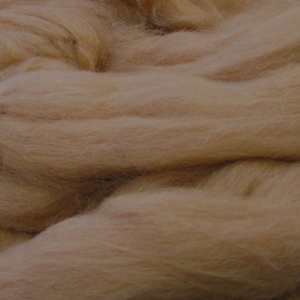 The light color of this Baby Camel Top also will appeal to dyers.